Hello! As you all may know, I have a thing for shoes, or rather a slight obsession; I just can't seem to get enough. And Jeffrey Campbell's designs always have me in awe. However, as a recent college graduate who has a very limited budget, I can't always satisfy my craving for every single pair of Jeffrey Campbells that captures my heart. However, Poshmark makes it a whole heck of a lot easier to be able to afford the shoes of my dreams. For those of you who are unfamiliar with Poshmark, Poshmark is an app on your phone that lets you buy and sell your gently used clothing, shoes and accessories. Often, you can score brand new Jeffrey Campbells or Jeffrey Campbells that have only been worn a couple times for just a fraction of the retail price. 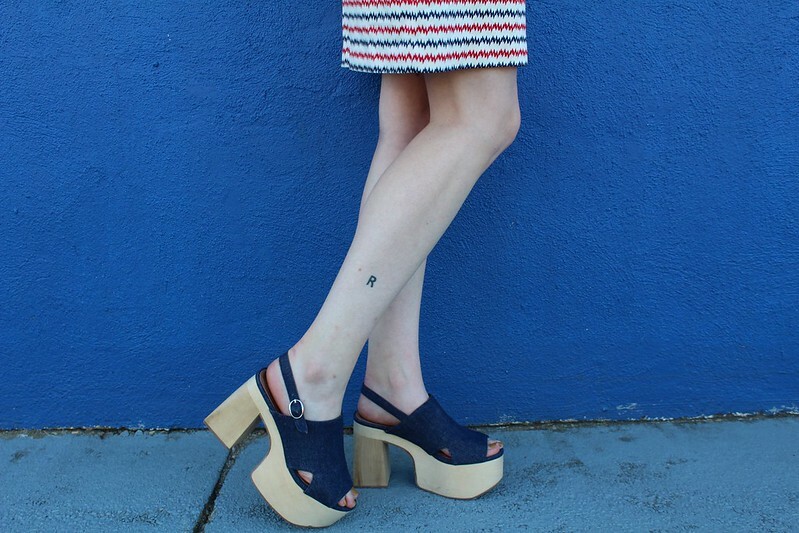 The absolutely BEAUTIFUL denim platform heels that I'm wearing above exemplify just that. I recently purchased these denim Jeffrey Campbells on Poshmark for just $50 + shipping. When I spotted these beauties, I immediately made an offer on them. They had never been worn before and perfectly fit in with my fall, seventies aesthetic (okay, my forever seventies aesthetic.) These shoes originally retailed for $155 and I scooped them up for just a third of that so I'd definitely consider that a "win." For this look, I wanted to style the shoes to create a super seventies, all american look so I pulled out this vintage dress from my wardrobe. Like my shoes, this dress was a major score. I recently purchased this vintage treasure at a yard sale for just $1- yes $1! It's usually much harder to find authentic vintage pieces from the sixties and seventies at yard sales and thrift shops so you can imagine how ecstatic I was to find this piece. The front zipper, vibrant colors, bold pockets and zig zag print couldn't be any more perfect. Even better yet, this dress fits me like a glove; yes, yes and yes to finding vintage pieces that fit like they were made for you! I highlighted the vintage all-American feel of the dress and heels with bold red lipstick, classic golden accessories and a fab pair of cat-eye sunglasses. Hello! So it's been a few months and I'm still not over monochromatic looks and aesthetics. But I'm totally okay with that because I find them just as enchanting as ever. 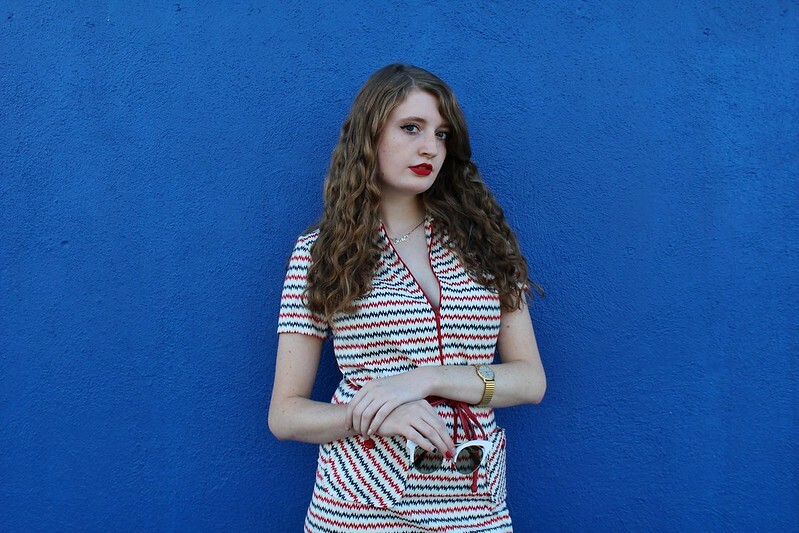 And what a thrill it is to a find a wall that perfectly matches my outfit! 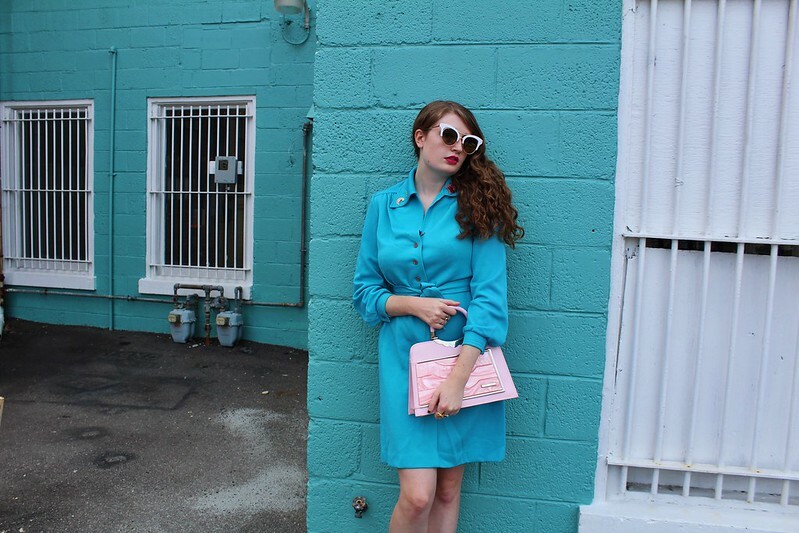 For this look, I'm modeling one of the recent additions to my etsy shop, RaddayVintage: a stunning turquoise vintage dress. And it could be yours for just $15.50 + shipping- check it out in RaddayVintage HERE. Luckily for me, I knew of just the wall to shoot these photos by. How fun is it how the color of the dress mimics the color of the wall? 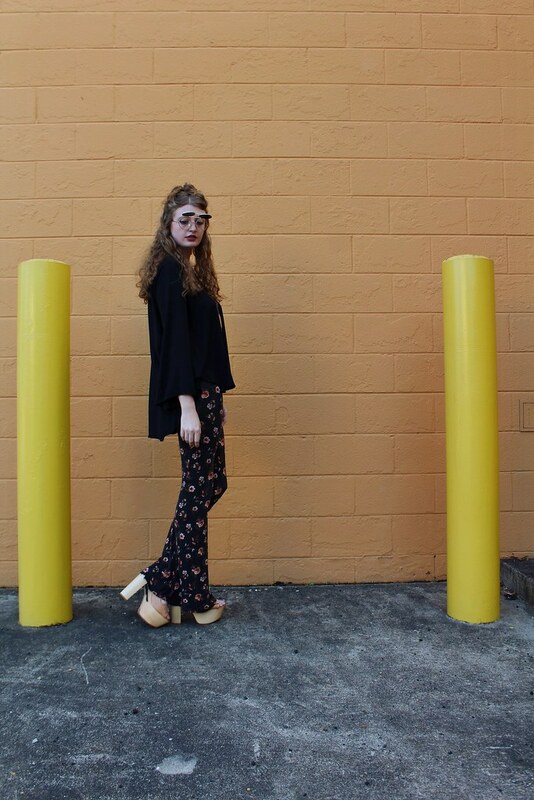 For this look, retro inspiration influenced my styling. 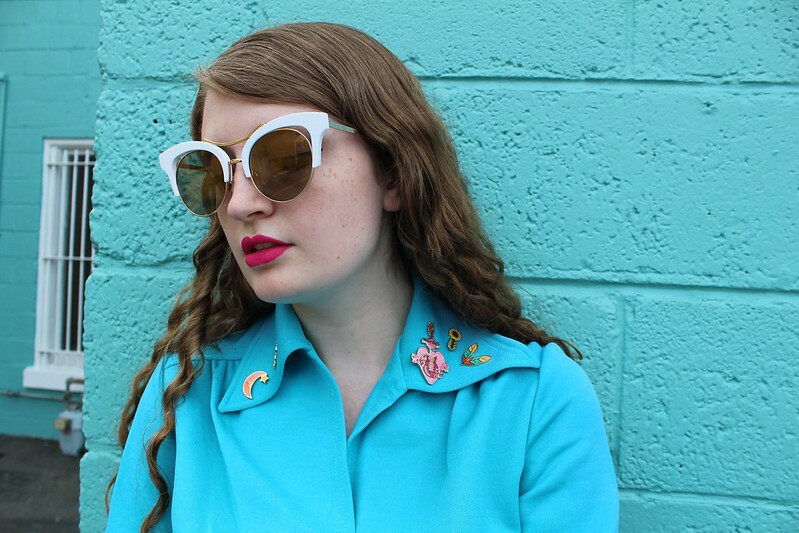 I slipped a few vibrant, playful pins on my dress, grabbed a pastel pink purse and slide on a statement pair of cat-eye sunglasses. A bold pink lipstick pulled the entire look together. 1. Cotton V Neck Vintage Long Sleeve Maxi Dress, $109. Wow! I absolutely adore the vibrant embroidery and breezy silhouette of this maxi dress. Perfect for wearing on date night with your significant other or sunday brunch with the fam. 2. Light Blue Embroidered Two Piece Crew Neck Sweet Midi Dress, $106. The feminine, ethereal essence of this dress has me swooning! 3. Black Elegant Abstract Asymmetric Midi Dress, $72. This dress feels more like a work of art than just another dress; I'm totally in love with the abstract, artistic print. 4. Cotton-blend H-line Shirt Collar 3/4 Sleeve Casual Shirt Dress, $88. The combination of the stripes with the floral embroidery on this dress are beyond chic. Pair this dress with your favorite booties and minimalistic golden jewelry for a stylish everyday look. 5. Half Sleeve Polyester Tribal Casual Mini Dress, $88. 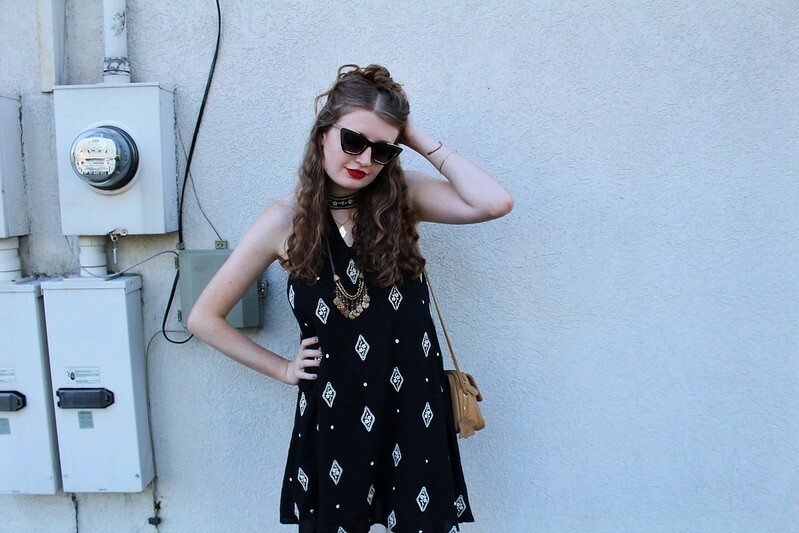 A true boho beaut. Which one of these dresses is your fave? Check out StyleWe to browse through the hundreds of other chic dresses that they have for sale. Hello! By far one of my favorite things about blogging is collaborating with so many like-minded people. There's just something so incredible about creative minds coming together to combine their inspiration and thoughts to create something entirely unique. Recently, I had the pleasure of collaborating with a few very talented Richmond creatives. Lonely Pine Jewelry, NailLordRox, Alex Haller Photography and Fashion, Trends & More/RaddayVintage all teamed up for this collaborative photoshoot. For this look, we were aiming for a feminine, free-spirited look. 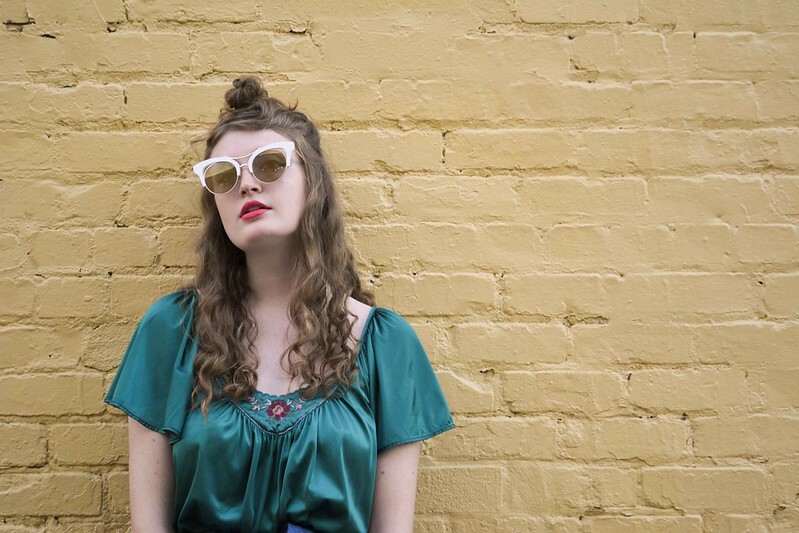 I styled the look around a gorgeous vintage green nightgown currently for sale in RaddayVintage. Although this vintage piece was originally intended to be worn as a nightgown, it's killer as a dress as well. If you're interested in adding this dress to your wardrobe, you can scoop it up in RaddayVintage for $19.50 + shipping here. 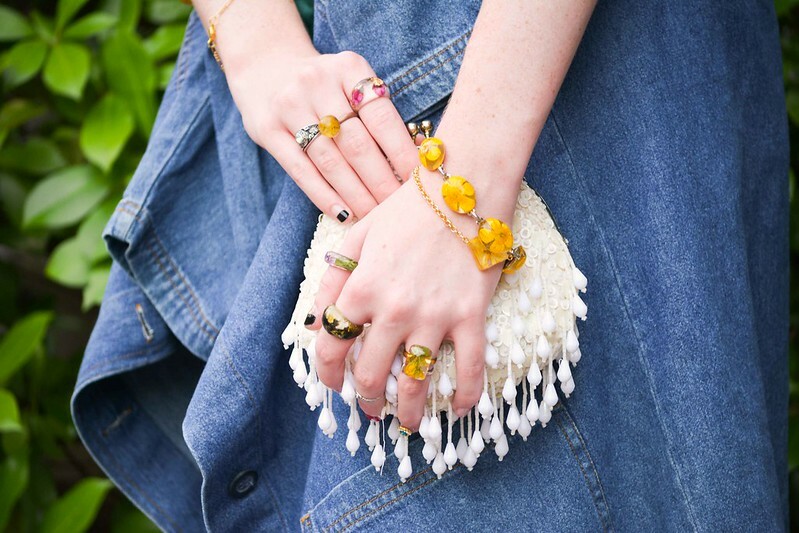 I tied on a vintage denim jacket and slipped on a pair of denim platform heels with the dress. A delicate vintage purse and trendy cat-eye sunglasses added to the free-spirited appeal of the look. From there, I was excited to style a handful of Lonely Pine Jewelry's pieces and NailLordRox's designs with the look. Lonely Pine Jewelry, a local Richmond jewelry brand, preserves nature's treasures in delicate rings, earrings, necklaces and bracelets. Owner and designer, Melody Milleker, works with plants, bones and stones to create truly astounding pieces of jewelry. Her pieces are priced reasonably for between $12-$32 + shipping and handling. For this shoot, we styled several of Milleker's designs with my look. 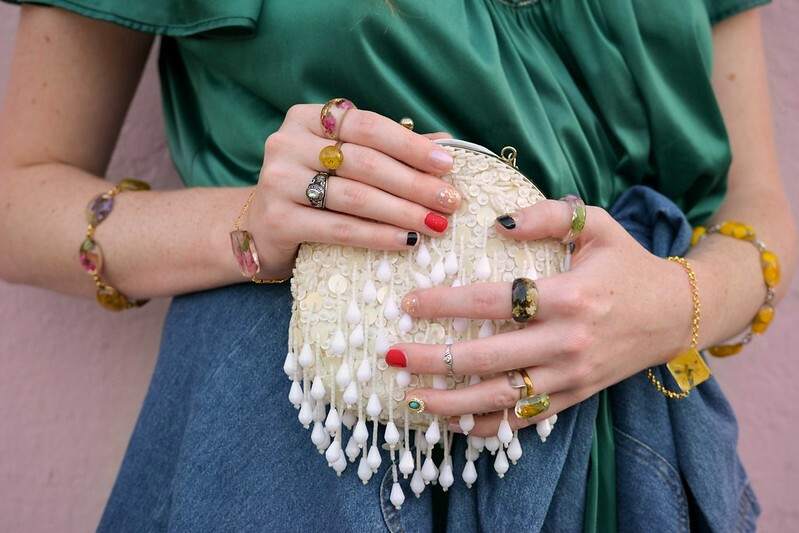 The free-spirited, boho appeal of her rings really captured my heart and I layered on ring after ring for the shoot. I also slipped on several breath-takingly beautiful bracelets. 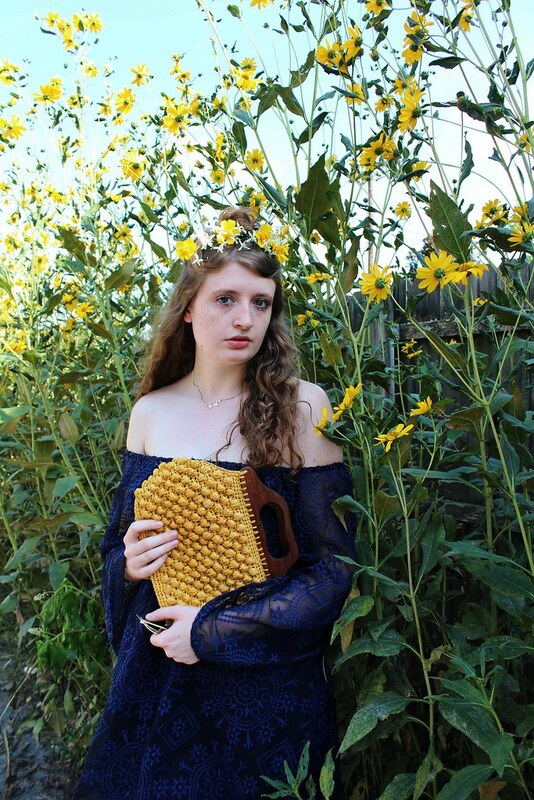 If you're interested in checking out Lonely Pine Jewelry (and trust me, you're going to want to), you can browse her website, Etsy shop or Instagram @lonelypinejewelry. 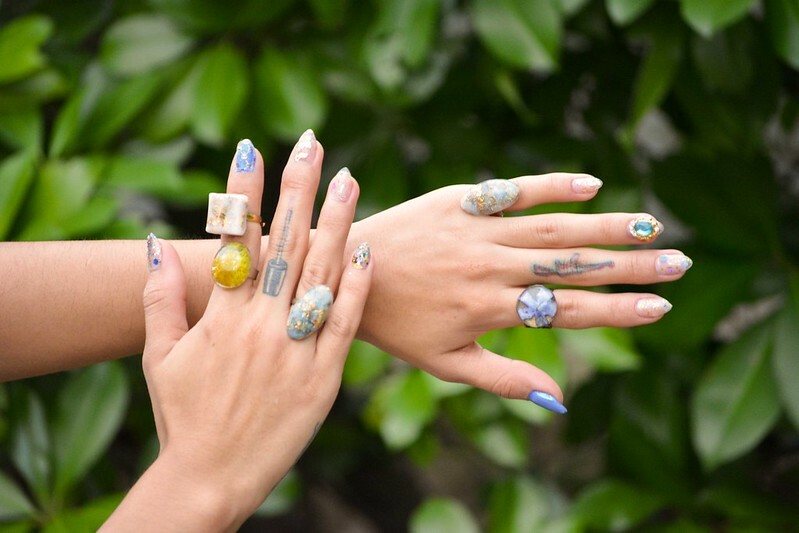 We accentuated the beauty of Milleker's designs with nail art by NailLordRox. NailLordRox otherwise known as Rox is a local Richmond nail artist. 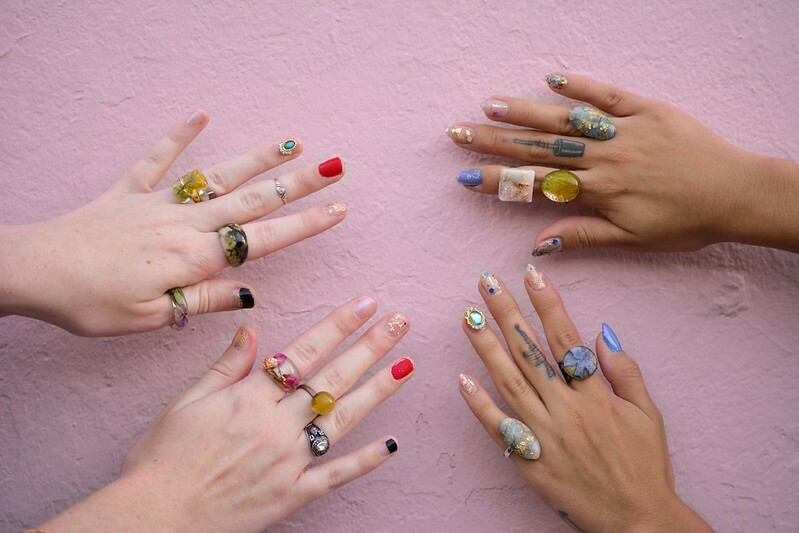 She constantly tries out the latest in nail trends and truly creates incredible nail designs. If you really want to kick your nails up a notch, I'd highly recommend Rox for her funky fresh designs. You can check her out on Instagram @naillordrox or follow her blog. Richmond locals, stop by Hair the Salon to have Rox work her magic with your nails. For this look, she did one of her popular mix and match manicures; I love how the different colors and designs really complement the style of this look. And we owe a large portion of the success of this shoot to Alex Haller, our wonderful photographer. You can check out more of her work on her Instagram @alexandrahaller.jpg, website or Facebook page. As a side note, if you're in the Richmond area, I'd love to collaborate! Just shoot me an email at tori@fashiontrendsmore.com and we'll get the creative juices flowing together. Hello! Recently, I can't get enough of the off-the-shoulder trend. 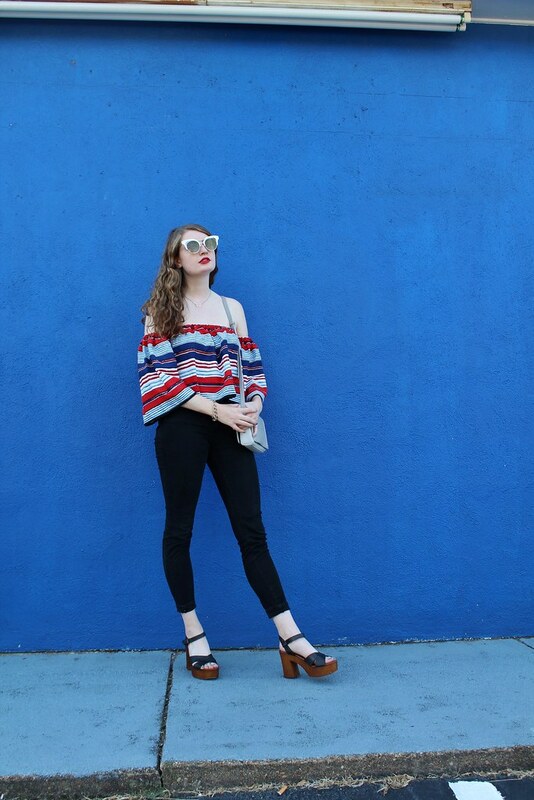 So when Tidebuy sent over this gorgeous red, white and blue off-the-shoulder top, I almost immediately fell in love with it. The vivid colors, trendy silhouette and effortless style of this top make it a piece that I know I'll be wearing practically on repeat throughout the fall season. If you're interested in scooping up this off-the-shoulder top for yourself, you can check it out at Tidebuy for just $11.75 here- what a steal! For this look, I styled the top with a black pair of high-rise skinnies and stylish black heels. Golden details like my "tori" necklace and vintage bracelet accentuated the modern class and style of this look. A simple gray crossbody bag, fabulous cat-eye sunnies and a bold pop of red lipstick perfected the look. Hello! Months later and I'm still not over the monochromatic trend. There's something so striking, so bold about a monochromatic look that I can't help but still be obsessed! However, my focus on baby blue and pastel pink monochrome has given way for more fall appropriate monochromatic looks such as this tan monochromatic outfit. 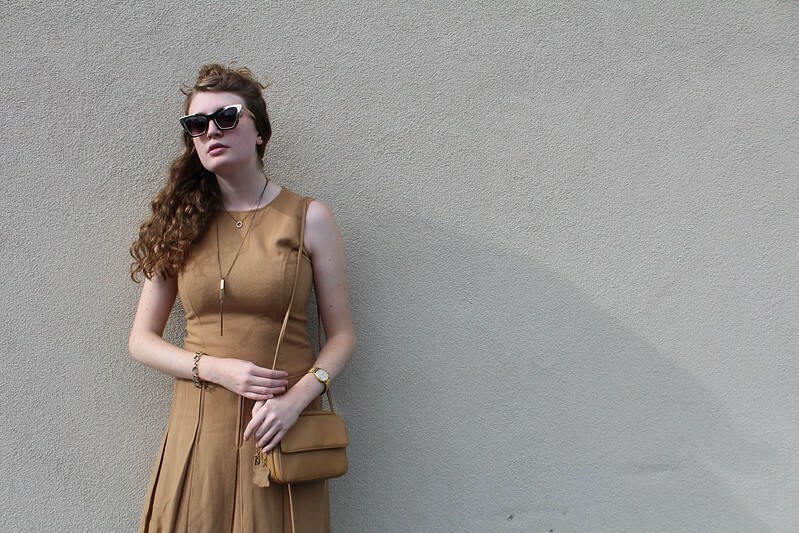 For this look, I started with this camel-colored vintage dress. I recently purchased this dress at Blue Bones Vintage for around $20 and am completely in love with it. The vintage appeal, wool texture, neutral color and pleats of this dress make it a dress that I know I'll wear time and time again. I added to the tan monochromatic appeal of the dress with a tan purse and tan feminine, pointy toed heels. I accessorized with several golden pieces of jewelry to accentuate the neutral color of my look. A statement pair of cat-eye sunglasses perfected the outfit. Hello! For this upcoming fall season, I'm swooning over anything gray. There's something so classic yet modern, versatile yet chic about the color gray that I can't help but love it. This stunner of a jumpsuit is one of my recent gray additions to my wardrobe and I can't get enough of it. The versatile print, charming gray color and interesting silhouette make this a real knock-out of a jumpsuit. For this look, I wanted to keep the jumpsuit modern yet classic. I slipped on a neutral-colored pair of platform heels and matching tan purse with the jumpsuit. I accessorized with several pieces of golden jewelry and classic sunglasses. Red lipstick perfected the look.